Would YOU recognize mold growing in your house? Cumberland County homeowners: if you saw mold in your home or farmhouse, would you recognize it? Mold is a type of fungi that can be found in certain conditions indoors and outside. The Centers for Disease Control and Prevention (CDC) claims that there are “tens of thousands to perhaps three hundred thousand or more” types in existence. This is where our expertise comes into play. Our trained professionals can identify different types of mold, and what potential problems they can cause. • Hazard Class A: the highest risk of infection, hazard or creation of toxins and should be removed immediately if discovered. • Hazard Class B: this group is known to cause allergic reactions, but not directly toxic. • Hazard Class C: these molds aren’t known to cause health risks, but can cause damage to the things they are growing on. The most common type of indoor molds includes Cladosporium, Penicillium, Alternaria, Stachybotrys chartarum and Aspergillus. Cladosporium, hazard class B and C, is one of the most common types of mold inside of houses because it can grow in cool areas, as well as warm and humid places. It’s often found on fabrics, carpets, toilets, air ducts, wood surfaces, and wood floors. When Cladosporium starts to grow, it’s black in color. Though the color may be worrisome to homeowners, the real danger is that their spores become airborne and can spread all around your house without you even realizing it. Another common type is Penicillium, classified as B or C, is found on things that have already been exposed to water. Carpet, wallpaper, insulation and furniture that have ever been wet or damp have a great chance of growing this blue or green mold. If you’ve ever seen moldy fruits or cheeses inside your home it was caused by Penicillium, a common food mold. Alternaria, hazard class B, is a common outdoor mold that appears in greenhouses or farmhouses, but can also make appearances inside, especially in your basement around those leaky pipes. Stachybotrys chartarum is a “black mold” and is under hazard class A because it sometimes is referred to as “toxic.” The mold itself is not toxic; it produces a toxic compound called mycotoxins, which can cause health issues for anybody that comes into contact with it. Sometimes when it grows, you may notice a musty smell along with it. This type of mold only grows in damp environments. One of the most popular molds that grow indoors is Aspergillus, which falls into both hazard classes A and B. It grows where there are high amounts of sugar and salt content. This is a common food spoiler and is known to grow on starchy foods like bread and potatoes. It can also grow on walls, insulation and damp clothing. All molds that are found inside your home are serious health risks. While not all of them are toxic, they can trigger health issues including respiratory issues, asthma attacks, allergic reactions, severe sinus infections, lung inflammation and more. Don’t let these molds take over your home and make you or your family sick. Call us at 888.665.3259 for assistance with all of your mold inspection and removal needs. Philadelphia Phillies fans, are you ready for the 2015 season? What better way to get ready then by constructing your very own viewing room? Instead of buying tickets for the cold-weather games, you can have a special way to watch them in the comfort of your own home, by turning your unused basement space into your very own man cave. With a few ideas and inspiration, you can bring your dream to a reality. Before you start thinking of ideas for your man cave, let us help you prepare. It is vital that you check to make sure that there is absolutely no moisture, humidity or waterproofing concerns. If mold exists, it WILL grow and WILL spread. This can cause damage to your basement, furniture, and sports memorabilia, and create potential health problems. You also need to be sure to correctly waterproof the room. If you hate being caught in the rain at the stadium, you’re really going to hate getting wet in your basement. By waterproofing your room, you can comfortably relax with the knowledge that you won’t have any flooding issues ruining your game. Check out this room we found on Pinterest! The owner decided to install a bar in his basement. Using regular bar chairs, they used team jerseys as chair back covers for a unique look. The walls and decorations are more of the old-school Phillies team and colors. The owner chose carpet to give the basement a warmer, more comfortable look. If you want to feel like you’re at the stadium, consider putting down a turf carpet, complete with chalk lines and bases. Maybe find room to put a popcorn and cotton candy machine too! Complete your room with a mini-fridge to hold your snacks and beer for the game. For decorations, you could hang up jerseys, blow up a picture of the Philly Phanatic, or go to a local sports store to find signs and other memorabilia. Whether you decide to make it look like a bar or a comfortable place for sitting, the possibilities are endless! If you live in Atlantic County and this interests you, call us at 888.665.3259 for help making sure your dry dream den can be a reality. Check out our Facebook album “Man Cave Monday” for more inspiration, and share your own photos! Whether you rent or own your home, mold is a serious issue. A small leak can turn into a big problem very quickly, so it’s important to address it as soon as possible. Check out this article below about a woman in NYC who discovered black mold in her apartment was the reason her daughters were getting sick, and what they had to do to get management’s attention. “A family has been forced to vacate its Upper East Side apartment after experts found unsafe levels of airborne black mold in the home, and the family says the building’s management company is doing nothing to help fix the problem. Resident Monica Iken says she is battling with Century Management to get rid of the mold that has left her two young daughters with headaches and forced her family to relocate. Iken says the mold stems from a leak in one of the apartment’s bathrooms. The management company thought the leak was caused by rainwater and let the leak fester for more than a year and a half, she says. The leak eventually spread across the ceiling through half of her apartment, causing the molding to crack, she says. When the management company finally tore open the bathroom, they saw the massive leak was coming from the upstairs apartment, Iken says. That’s when the mold became airborne and spread all over the apartment, according to test results Iken received from a mold expert. Iken, her husband, two daughters, and the cats vacated their apartment nearly a month ago, but she says they are still waiting for Century Management to help them. When Iken decided to take matters into her own hands to get rid of the mold, the management company wouldn’t even let her do that, she says. Instead, the management company has told her they are waiting for their own mold expert to assess the situation. NBC 4 New York reached out to Century Management, which declined to comment. Meanwhile, her daughters, who have complained of headaches, are being tested to see if the mold entered their bloodstream. If you’ve discovered mold or water in your home, call our professionals at 888.665.3259 to help eliminate it so that you can live in a healthy home. Man Cave Monday: Movie Night! Have you considered the idea of installing your very own home movie theater? In this week’s Man Cave Monday, we want to give you ideas on bringing the big screen into your home. Before you start construction, make sure your basement is waterproofed. With all of those extra wires and electronics, if water finds a way into your basement, it could cause irreparable damage to your equipment. Don’t forget to check for mold! We can help you remove any mold that you may find while prepping your basement. It will grow if left untreated, so it needs to be taken care of before you build on top of it. Choose whatever kind of floor that fits your needs. A carpeted room makes the theater feel more comfortable. But a hard, smooth surface makes it easier to clean up spilled food and sodas. Invest in a good sound system and quality television to get that extra “movie theater” feel. When installing the lights, go for lighter, more “yellow” toned lights that dim easy. Movie rooms tend to be darker to prevent glares on the screen. You can’t have a movie theater without great snacks! Keep a mini snack stand filled with treats for your family to snack on. It’s also very easy to get your hands on a small popcorn or cotton candy machine. The comfier chairs you find, the better! A few extra dollars towards the recliners with the cup holder and extra cushion goes a long way. This room has super plush seating complemented by favorite movie posters. Try wall stickers to personalize your movie room. Install pin lights in your ceiling, to enjoy a night under the “stars”. If you’re in Gloucester County or the surrounding areas, call us at 856.665.3259 for a free waterproofing or mold inspection and make your basement the star of your own movie man cave. Slab Foundation vs. Crawl Space: What’s the Difference? When you’re building a new home or getting ready to buy a house, you need to be familiar with what’s underneath your foundation. Whether it’s on top of a crawl space or just sitting on top of a slab foundation, familiarizing yourself with the differences of the two will help you be more aware of what’s underneath of you and how easy mold could get in. When concrete slabs are first put down, one of the most important steps is the engineering. As the slab gets laid down and the foundation of the home starts to be built, there’s a special way to remove water away from the future house. A well-constructed slab will have a break in between the concrete and the ground to prevent water from seeping underneath. The break will prevent future possibilities of mold under the house, which could lead to a collapsed foundation. An advantage of having your home built on top of a concrete slab is that there’s no basement. You never have to worry about the bottom floor flooding or mold appearing in the cracks of the underground room. But, just because there’s no basement doesn’t mean that mold can’t find a way into your home. Another positive of the slab foundation is that it will save you money. A leaking pipe, faulty shower drainage, or any other water leakage won’t be able to rot the concrete slab floor. Because there is no underground crawl space or basement, you have less space to heat/air condition, saving you more money. As long as water is properly drained away, you won’t have to worry about a flooded basement or mold growing on concrete walls underneath your house because you won’t have any. If the crawl space under your new home is big enough, everything that has to do with your heating, air conditioning, and plumbing can be in one small space. If there are any problems, you know exactly where to go to fix it. Also, if any leakage springs, you can catch it in that small space before it spreads out to the rest of your house. Another advantage of having a crawl space is that you have a little bit more of an elevated house, which gets you off the ground and away from bugs, termites and flooding in your house. While these factors could occur in the crawlspace, it will usually be away from you and your family. With a crawl space, you need to be sure that there is proper drainage provided to funnel water away from it. If the crawl space floods, anything that you keep stored there will be affected and more susceptible to mold growth. Having a home with a basement can be great for storage and extra living space, but also requires care to ensure water or mold aren’t present. If the basement has water penetration issues from bad grading, issues with gutters or downspouts, sprinkler systems, ground water and hydro-static pressure, these things can cause water penetration through the foundation and into the basement. This should be noticed at home inspection, but due to weather conditions and other factors at time of inspection, some of these issues could go unnoticed. If you start to notice musty odors or see moisture or mold, we can inspect your basement to make sure any problems are quickly and properly addressed. Always be sure to take the extra steps to fight mold growth, no matter which type of foundation you have. So, before buying your next home or selling your present home, contact Perfect Basement to get peace of mind, knowing you have a healthy space. If you live in Cape May or the surrounding areas, contact us for a free inspection of your foundation issues at 888.665.3259. If you’ve been thinking about redoing your basement, we’re here to help! Have you considered turning that unused space into the ultimate man cave? Try transforming it into a home gym! You can get in shape without leaving the comfort of your house and avoid the expensive monthly gym memberships. The most important thing to remember about building your home gym is getting your basement in shape first. Before you start constructing your man cave, be sure you take steps to ensure it is mold-free. When you build over unresolved issues, mold will still continue to grow, which can lead to future structure damage or health issues. Also, heat and moisture can build up from your workouts, and if that is trapped inside the room, mold starts to grow. Keep your gym well ventilated to keep this from happening. This family did a simple renovation that made their basement look great. They added a mirror to one wall and did a new paint job on the rest of the room. Then they installed a new carpet and overhead light system. There are minimal decorations but plenty of room for their workout equipment. Play around with different types of flooring, such as tile, wood, or mats to keep the room cooler, easier to clean, and in some cases, better for exercising. Hang up different posters of your favorite athletes or models for motivation. Write your goal out and have it hanging up in a frame somewhere in the room, so you’re constantly reminded why you’re there. Put a small television or sound system to keep you from getting bored of the repetition. Spread your machines and equipment out around the room to create areas for what part of the body you’re focusing on that day. Keep a mini fridge within reach to keep your water and healthy snacks close by. Decoist has great ideas on building home gyms that are beautiful and functional. This home gym from Houzz.com has a lap pool – in the basement! HGTV has ideas for “Manly Home Gyms“, that are user-friendly for everyone. Now that your mind is flexing over this idea, let us help you make it a reality. If you live in Cape May County or the surrounding area, give us a call us at 888.665.3259 for help getting your basement in perfect shape! No Water, No Mold, No Problem! Nobody wants to see or deal with mold. Before it even becomes an issue, taking the proper steps to prevent it altogether is vital to keeping you and your family safe. Mold grows because of water. If your house, specifically your basement, is prone to flooding or has a history of water damage, it may be showing early signs of mold – like musty pungent odors, dampness, high humidity levels, or water seepage into your basement or crawl space. Waterproofing or mold problems in your home can create health concerns as well as do damage to your property and negatively affect the value and resale of your property. We can offer you options and solutions for your mold or waterproofing concerns. Even if no water exists, having a sump pump in your basement is a great precautionary tool. It will send away any water from the house. If you have an older sump pump that came with your house, make sure that it still works properly, to be prepared in case of water damage. Dehumidification and air quality are two very important, and many times overlooked, components to a healthy basement. If your basement is made from concrete or brick walls, sometimes it can feel like there’s too much moisture in the air. These types of foundations are always absorbing water from outside your home, and the moisture gets released inside. Having a dehumidifier active in your basement will capture that extra wet air and humidity that can contribute to mold growth. There are many options of dehumidifiers, such as Wave and Humidex units, and vent fans with controls for humidity or heat. We can help you decide what is best for your basement, based on its size, amount of moisture, and other factors, once we complete your inspection. Many basements already have some insulation to keep water out and heat inside. For the best protection, use insulations made from thick foam instead of those made from fiberglass. The thicker foam-based insulations protect against moisture, stay in place and don’t shrink, all while stopping cool drafts from entering your home. If adding or replacing insulation, consult a professional for the appropriate R-value materials for your home. If you ever need a temporary fix to a wall crack, find a system that can work under all conditions. When a wall’s foundation wall starts to split, it will eventually need permanent care. Until then, find a crack repair that can withstand water, won’t shrink from cool air and can stay glued to the same spot. Whether you have a finished basement or not, long-lasting flooring is key. If you decide to install flooring, use something that is both comfortable and durable. Underneath every floor is concrete, which is constantly absorbing moisture. The better, more stable type of floor you have, the less of a chance you have of water sneaking in. If your washer and drying machine are stationed in your basement, having strong hoses that remove the water out of your basement is a must. When you’re looking for a hose with a new washing machine or replacing an old one, find heavy-duty hoses with durable material to prevent the possibility of leaks. Remember, leaks lead to water, and water can lead to mold. When looking for products that will help in waterproofing your basement, we can make sure you’re getting something sturdy and reliable. A dry basement is a healthy basement. If you live in Cape May or the surrounding areas, call us for a free inspection to identify water issues you may have at 888.665.3259, or contact us online. Man Cave Monday: Got Game? Have you thought about installing a game room in your home? Even better, have your basement dedicated to it? If you want a place to have your poker nights or game hobbies, why not install it right into your very own man cave? We would be happy to help you get your basement ready so you can turn it into the supreme man cave. 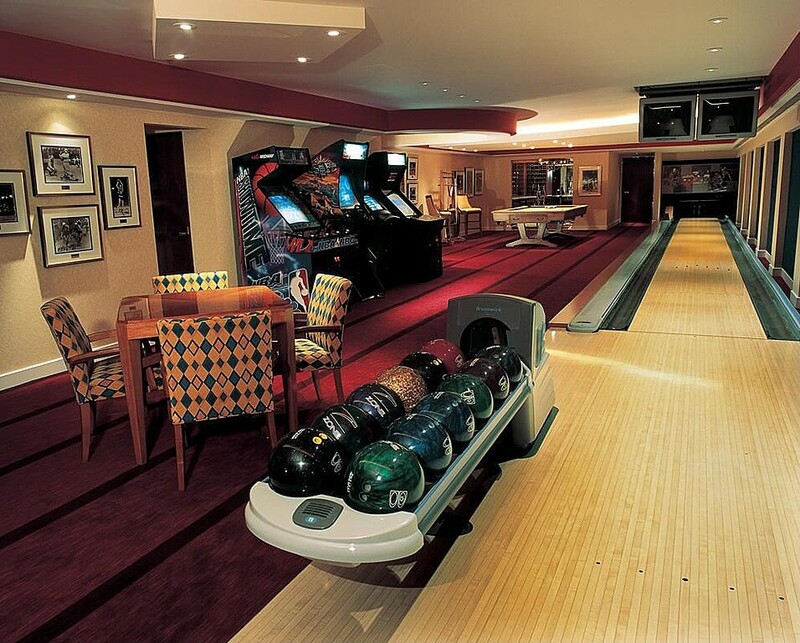 Whether you want a bowling alley, golf green, pool table, or arcade before you start planning what you want in your man cave, be sure to prepare your basement properly. This includes waterproofing and checking for mold. After your basement is up and running, you don’t want to have any surprise floods ruin all of your hard work. Consider putting in arcade and video games to make your man cave into a game room. Think: old school Pac-Man, Galaga, Dig Dug, and any other games you remember as a child. Maybe you found an old Nintendo 64? Put a television down there, hook up the console, and enjoy the memories. Transform your basement into a poker and card room, filled with appropriate tables, cards, chips, and dim lighting. If you’re a fan of golf, install a turf rug and make your own miniature golf course right in your home! Or if you’re working with a smaller space, invest in a Wii and a great golf video game. Put your TV high enough that you have to stand in front of it and decorate your surroundings like you’re on a golf terrain. Missing those roller-skating days from when you were a kid? Install a finished wooden floor, grab a pair of skates and go! To get even more of a roller-rink feel, put in an air hockey or foosball table for added fun. 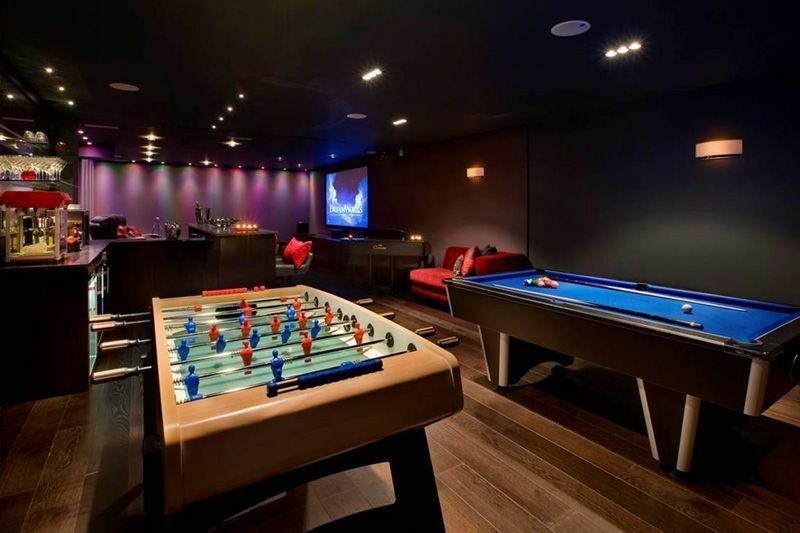 Check out this picture of a basement game room. The owners took the time to install a bowling alley, arcade games, and a pool table in their home. Who says you can’t do it too? The main attraction is their bowling lane. You and your family could do the same with a little basement renovation. If you like these ideas, check out some more below. If you are located in Burlington County or the surrounding areas, we’d be happy to help you prepare for your brand new basement. We can help you make your dream man cave come to life easier than you think. Just call us at 888.665.3259. The next time you’re surprised at finding mold in your house, whether it’s in a ceiling in a bathroom, or from a wet corner of your basement, remember; there are people that inspect and work with mold for a living. It doesn’t sound like the most appealing job, but we professionals work hard to do the dirty work…literally. And we do it to keep YOU safe. As a Certified Mold Inspector, we tackle mold daily to ensure safety to your family and home. We are professionals who have gone through training and certifications to study, remove and fix the mold found in your house or business. So what does it take to get the title of a Certified Mold Inspector? Before becoming an official Certified Mold Inspector, we attend courses to become certified in Mold Inspection and Remediation. The training to becoming certified may vary in technique but has the same requirements nationwide. There are a number of Certifications and Association connected to the Mold Industry. Perfect Basement carries the following certifications: CRMI – Certified Residential Mold Inspector, CMR – Certified Mold Remediator. Perfect Basement also has been a part of NAMRI – National Association of Mold Remediators and Inspectors. Once certified, we are qualified to find mold that is hidden, or identify existing mold that’s already out in the open. We know exactly what to look for, and will be able to tell if the mold poses as a health threat or if it’s potentially damaging. If you live in Gloucester County or the surrounding area, call us for a free professional mold inspection in your home at 888.665.3259. Want to earn $250.00? Refer us to a family member or friend with the use of Social Media! With the cold, winter season coming to a close and warmer weather in our near future, it’s the perfect time to call Perfect Basement for our mold removal or waterproofing services. Click on or and share them with your family and friends. Have them contact us and give your name. Once the contract for their project is signed (and the total price of their project is over $2,400.00), we will give you $250.00 as a thank you for the referral. But hurry! This offer only runs until April 15th,. Your family or friends’ project can start after that date, but their contract MUST be signed by April 15th. Any contract that gets signed after April 15th will receive our normal $150.00 reward for referring qualifying customers. For any questions or more information on our special or services, give us a call at 888.665.3259.